Converse is running “Shoes Are Boring”, a print, outdoor and television advertising campaign promoting the wearing of sneakers as a symbol of alternative culture. Print ads featured here are Bathtub, Boxer, Meat Grinder (skating), Big Hand, Aftermath, Lobby Painting and Garage Door. Shoes keep it down. Sneakers make a scene. Shoes go running at dawn. Sneakers go home at dawn. Shoes party. Sneakers after party. 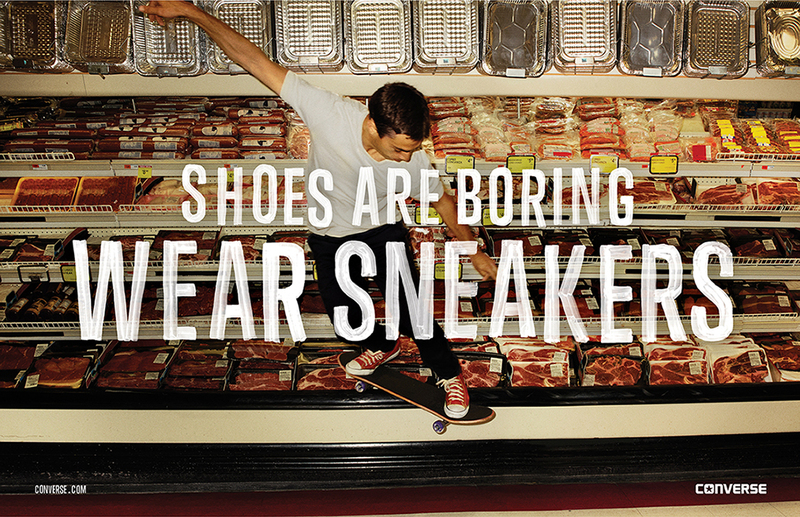 Shoes hit the deck. Sneakers nail the landing. Shoes keep it clean. Sneakers get dirty. 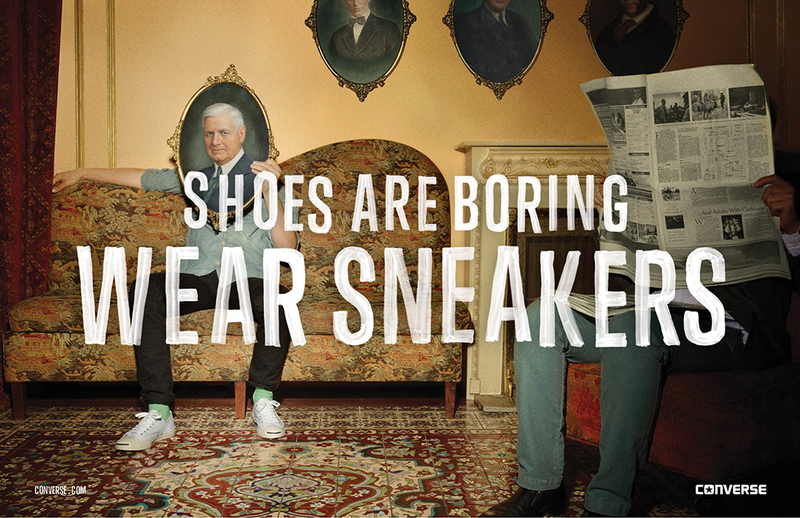 Shoes pay the fare. 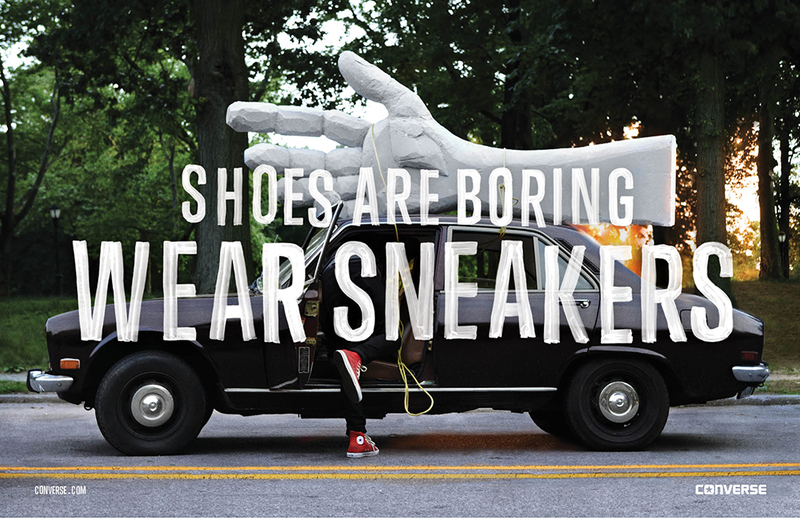 Sneakers ride for free. 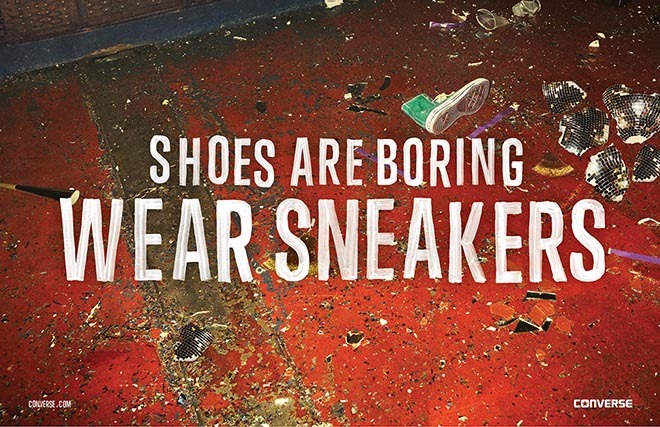 Shoes are boring. 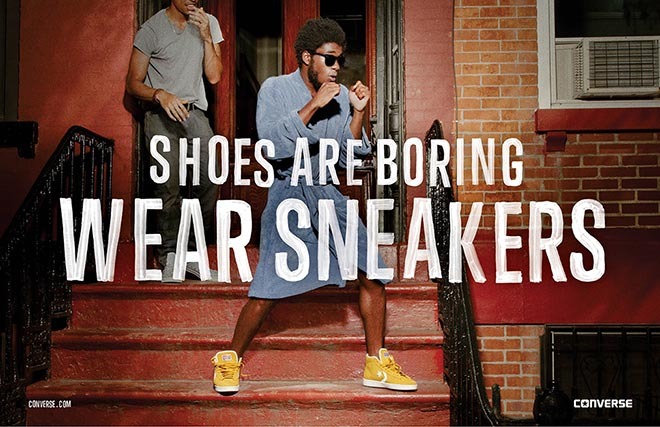 Wear sneakers. 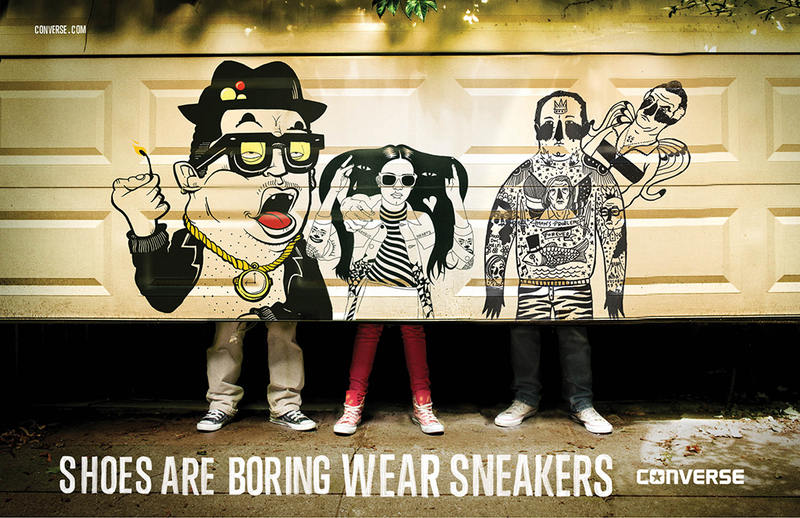 The Converse Shoes Are Boring campaign was developed at Anomaly, New York by chief creative officer Mike Byrne, executive creative directors Ian Toombs and Sheena Brady, art director Roy Torres, copywriter Nick Terzis, agency producer (print) Sarah Manna, agency producers (TV) Matt Flaherty and Kristine Ling, executive producer/head of production Andrew Loevenguth, account director Jill Ong and account manager Lauren Bozarth. Photographer was Magdalena Wosinska. Filming was shot by director Tristan Patterson via Smuggler with executive producers Brian Carmody, Patrick Milling Smith, Lisa Rich, Allison Kunzman, Laura Thoel, head of production Andrew Colon, producer Gustav Geldenhuys, production supervisor Taeko Masuyama, director of photography Matthew J Lloyd, 1st AD Rudy van Zyl, production designer Michael Grasley, art director Nick Kelley and costume designer Jennifer Johnson. Editor was Aaron Langley at Cosmo Street. Telecine was produced at Company 3. Visual effects were produced at Switch. Sound was produced at Heard City.